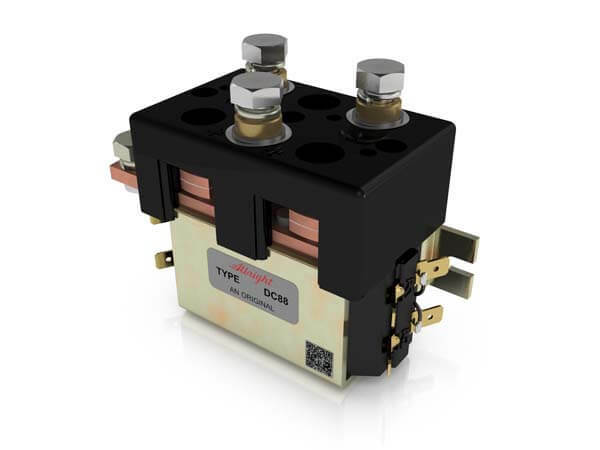 The DC88 motor reversing type of contactor has been designed for direct current loads, particularly motors as used on electric vehicles such as industrial trucks. The DC88 is a monoblock construction, resulting in a compact design which is compatible with modern electronic control systems. Developed for both interrupted and uninterrupted loads, the DC88 is suitable for switching Resistive, Capacitive and Inductive loads. The main contact circuit, designed for motor reversing, has a built in failsafe, so that if both coils are energised simultaneously the contact arrangement is open circuit. The DC88 has double breaking main contacts with silver alloy contact tips, which are weld resistant, hard wearing and have excellent conductivity. The DC88 M8 main stud terminals can be configured in a variety of ways in order to suit the application. Coil connections are by means of 6.3mm spades and mounting is via the supplied bracket and can be horizontal or vertical, when vertical the M8 contact studs should point upwards. If the requirement is for downwards orientation we can adjust the contactor to compensate for this. Show product Options or make an enquiry. Blowouts 600A at 80V D.C.
No Blowouts 800A at 48V D.C.